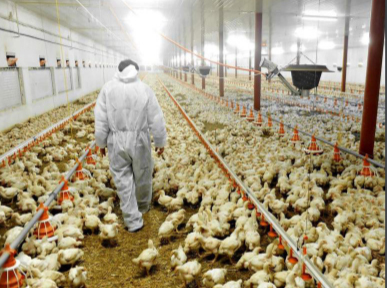 16 Jan 2019 --- NGO World Animal Protection (WAP) has slammed some of the world’s largest fast food chains for their treatment of chickens, in a new global report released this week. The report, entitled “The Pecking Order,” rated the eight companies surveyed as either “poor” or “failing” on animal welfare standards. In response to this, the companies outlined – McDonald's, KFC, Burger King, Pizza Hut, Subway, Nando’s, Starbucks and Domino’s – maintain that their animal welfare standards are up to scratch. 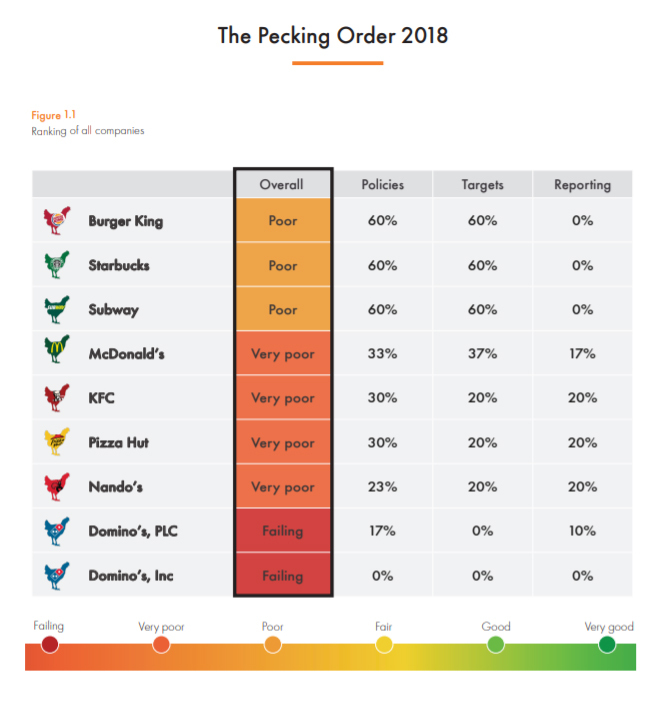 Click to EnlargeSource: World Animal Protection, The Pecking Order reportThree of the chains in question – Burger King, Starbucks and Subway ­– had policies to address the problems but in only one region or country, while none had a global system for improving chicken welfare, the report highlighted. Speaking to FoodIngredientsFirst, the fast food chains hit back at the report, insisting they have high animal welfare guidelines and standards. The spokesperson adds that KFC’s global animal welfare policy covers the full production process and focuses on four outcomes of animal health and welfare. “Geographical flexibility is considered, in terms of process mandates, but successful outcome measures are consistent. Our policy also outlines a process of reporting and transparency, which will be completed in the next two years,” they add. McDonald's stressed that they are committed to taking a holistic, outcomes-based approach to chicken sustainability and has been working on this for more than a decade, together with suppliers, NGOs, academics and industry experts. Using Controlled Atmospheric Stunning at slaughter is common practice in large parts of our supply chain already, and by 2024 it will be required globally. 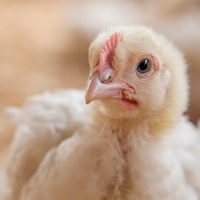 The company maintains that they are taking a global approach accounting for differences you would expect in a global supply chain, including but not limited to climate, genetics, housing type and farming systems across geographies while remaining focused overall on what is most meaningful to chicken welfare. Since May 2018 100 percent of chicken served in McDonald’s restaurants in the Netherlands already originates from enriched housing. This means all of the company’s farmers provide natural daylight and enrichment materials in their stables to encourage natural behavior, says the fast food giant. “Our global animal welfare policy covers the full production process and focuses on four outcomes of animal health and welfare. Geographical flexibility is considered, in terms of process mandates, but successful outcome measures are consistent,” Pizza Hut explained, highlighting that the company policy also outlines a process of reporting and transparency, which will be completed in the next two years. The spokesperson adds that the company is committed to improving chicken welfare standards across the supply chain and are working with Compassion In World Farming in Europe and the US. “All our chicken suppliers source from independently verified farm assured schemes which go above the minimum requirements of legislation to produce to a higher welfare standard. All our meat suppliers and their abattoirs are required to comply with the relevant legislation. We look forward to receiving the full details of WAP’s assessment,” a Subway spokesperson says. “Our internal technical teams undertake regular visits to all our suppliers across the world and we employ independent auditing companies to make extra checks. We are confident that these processes ensure that the chicken we serve meets the high standards which our customers demand,” notes the Nando’s spokesperson. “However, in most areas where they operate, companies do not even guarantee a humane slaughter for the chickens used in their businesses,” says the organization. According to WAP, “most of the 60 billion chickens farmed annually worldwide endure acute and severe suffering.” Starting as newborn chicks, they are forced to reach their slaughter weight in around 40 days. Such an unnaturally fast growth rate places an enormous strain on young bodies and their lives are made even worse through cruel confinement in crowded, featureless and unnaturally lit sheds, the public statement reads. Through the organization’s “Change for Chickens” campaign, awareness is growing. This all comes to light following a slew of recent developments in the standards of animal welfare. At the start of this month, so-called “no-kill” eggs hit shelves in Germany, which are tipped as potentially ending the culling of billions of male chicks. Click to EnlargeSource: World Animal Protection, The Pecking Order reportMore recently, Belgium banned halal and kosher slaughter practices, which sees animals killed without being stunned first and came into effect in the Flanders regions of the country. Animals must now be stunned before their throats are cut in religious rituals, but Jewish and Muslim groups say the new rules violate EU freedom of religion laws. The sector continues to remain under the spotlight as animal welfare issues intensify. Food manufacturers have also been making progress in this area. For example, in October 2018, Nestlé and six other food companies (Aramark, Compass Group, Elior Group, IKEA Food Services, Nestlé, Sodexo and Unilever), joined forces through the Global Coalition for Animal Welfare (GCAW) to advance animal welfare standards throughout the global food supply chain. Nestlé also announced that it would source cage-free eggs only as ingredients for all its food products globally by 2025. 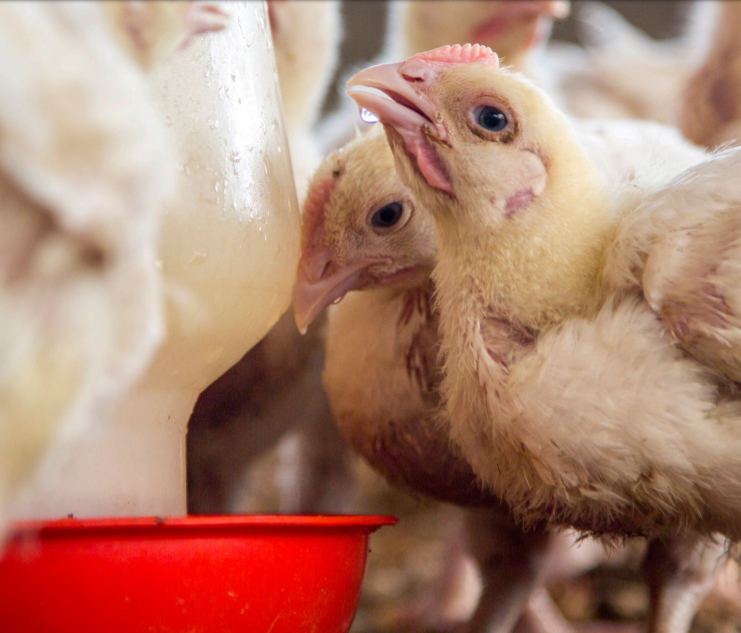 In October 2017, Nestlé also pledged to improve conditions for chickens raised to provide meat ingredients for its businesses in the US. This was followed by an announcement in June 2018 to implement similar improvements for all of its food products in Europe.